The past couple of weeks have been way too busy over here (big changes at work and a possible relocation to Brooklyn is in the works! 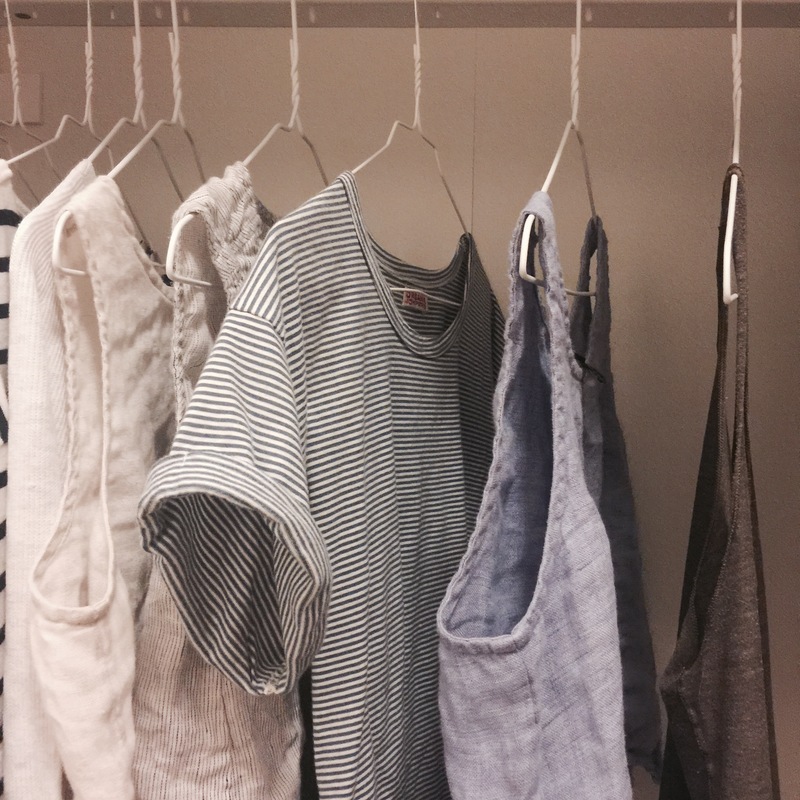 )… But now I’m back and have a few closet updates to share. The picture above shows all the tops I wore this past week. Notice the 3 linen tops? They’re all secondhand EF shell tops, slightly cropped. They feel very airy without the frumpy factor seen with EF’s longer tunic-y tops. I love the way linen bounces back after each wash. It doesn’t shrink. It contracts. I also bought my very first organic by john patrick top (the stripe one in the middle). Love the softness and drape of it. They look tomboy-cute tucked into high waisted anything. Speaking of high waisted, I’ve been trying to find a good pair of secondhand madewell perfect summer jeans. I finally lost enough weight to fit into 27’s again. I have a pair of pre owned size 28, which had fit around the waist but was much too baggy around my thighs. If anyone needs a size 28, let me know. Big news in the shoe dept again. I used my credit card points to buy a new pair of arizona birkenstocks from Nordstroms this week. This time in taupe suede. The color seems to go with everything! The only problem was that I accidentally bought the soft footbed, which is disappointingly unsupportive. There is a bit of arch support but my feet are craving the beat down of the original hard footbed. Those were sold out everywhere in this color. Sad. I love the color so much though that I ended up keeping them despite the footbed. And finally, I’ve mastered the everlane day flats. I Macgyver’d my way to a good fit; with a tiny pair of scissors, I cut the elastic band at the heel, discreetly from the inside and voila!, no more dents on my achilles tendons. The elastic heel issue would have been a problem even if I sized up, I think. It’s ridiculous how friggin tight they made it. Seems like Everlane’s Italian shoe makers don’t test their shoes on real people. But I will say they are chic and I still love them. Funny you should bring up the soft footbeds! I bought a pair of new Arizonas with soft footbeds from Nordstrom about 6 weeks ago, I kept trying and trying to love them, and I finally returned them yesterday. They are no where near as comfortable as the original beds! I kept thinking the foam would pack down, (and maybe it would with more time), but it sure didn’t seem like it. Also, the foam made my feet hot! I have been wearing Birkenstocks for the better part of 20 years, and I hope the soft footbed doesn’t stick around. In my opinion in negates the reason we all buy Birkenstocks. Aw man I was hoping the foam would give way to more support over time. I’ll have to wait until the hard footbed is available then sell the soft ones. Thanks for the heads up! i would be interested in your madewell size 28s! would love more details/photos if possible. Sure thing. Can you submit a form with your email on my blog roll page (it will be private) and I’ll send you a link w the pics. Thanks!! Moving to Brooklyn?! That would be a big change. What neighborhoods are you considering? Where are you finding your secondhand EF shirts? If you don’t mind me asking! I daydream (kind of) about finding the perfect linen garments secondhand. I second jesse.anne.o: where do you find them? I think recall reading that you no longer wear heels. How does that affect your day to day life? And what shoes would you wear for a formal occasion? Yep that’s right. I don’t wear heels anymore and it makes life better. If I want some height I’ll wear platform sandals that have a small slope. And if it is a formal occasion, I’ll wear heels that are 1.5 inches with a block heel. I love a cute block heel much more than any skinny heel. They make heels way more tolerable.